In life, we often find out who we are when faced with various trials and tribulations. Those challenges shape and mold our character and gives us an opportunity to ‘Level Up’. Such rings true for 20-year-old Centralina WDB NextGen customer Hunter Hammond, whose family home caught fire back in January. Thankfully, neither Hunter nor his mother were injured in the blaze, but the family lost everything. Despite this personal tragedy, he enrolled in the welding program at Stanly Community College. “We all face obstacles in life and it’s up to us to choose whether we let that define us or break us,” said Hunter. Classes started in February for Hunter and he has received good grades even though he is living with other family members while he and his mom get back on their feet. “I just kept my head up and kept pushing and going forward,” added Hunter. 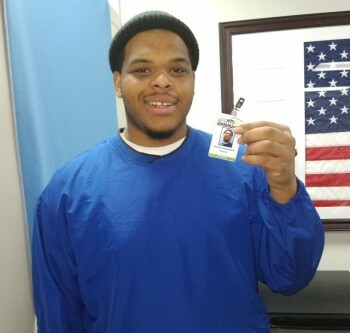 “Helping others to reach their full potential with a little push,” said Detric Allen, NextGen Career Development Specialist at the Centralina NCWorks Career Center in Stanly County who has worked with Hunter since he joined NextGen last fall. Allen hopes that he instills a “Never Give Up” attitude in all the NextGen youth that he works with. To learn more about NextGen services, visit www.centralinaworks.com.